We're excited to feature writers with unique stories: Michelle Ibarra, Alberto G, Remi Graves, Jahan Khalighi, Tajae Brown, Chelsea Dillaha, Sanam Sulveen, Dominic Lim, Andrea Torres, Tiana Altman, and Margo Perin. We are proud to present more voices of youth in our anthologies, Poems from Below and Why Does This Poem Have to End? Michelle Ibarra is a junior at a high school specializing in the arts. She was the 2017 guest spoken word artist at the Alliance for Girls Women's Conference, a 2017 semifinalist in the Youth Speaks Poetry Slam Competition and the 2017 runner up in the SF Poetry Out Loud Competition. She hopes to further pursue poetry and share her personal story with others. To Love A Latina illuminates the love, inspiration and empowerment that Michelle brings to her audiences. Our lips are ghost peppers, marinated with la lengua de nuestros antepasados . . .
Alberto G is a young poet of many rhythms and feels a strong connection between poetry and music. He has a wealth of talent and mentors and inspires youth based on his own experiences and struggles. He is excited to be published for the first time and to share his Life Story. Some would call that a tragedy, but all was good I was adopted at three . . .
Remi Graves is based in London and currently pursues the things she loves, namely writing poetry and playing the drums. She is a member of the Roundhouse Poetry Collective and co-presents a monthly radio show called the Two Step. Her poem Ghosts of Gao was inspired by the banning of music in Mali. Click here to see Remi performing live! The whole world turns a blind eye . . .
Jahan Khalighi is a poet, spoken word artist, musician, and educator who is passionate about the way creative expression can facilitate personal and social transformation, beautifully portrayed in What You See. He was a two-time member of the Eugene Poetry Slam Team and Co-Founder of CommuniTree an arts, ecology and social justice project based out of Oakland, CA. He served as a poet teacher for June Jordan's Poetry For The People program at UC Berkeley and currently teaches as a poet-in-residence for California Poets In The Schools. He is a member of the Justice Arts Collective a multicultural group of poets, musicians, dancers dedicated to social justice through the arts and community building. Tajae Brown is a senior at San Francisco Waldorf High school. She will be attending Howard University next year. She aspires to be a physician and eventually open up her own clinic in an underserved community. We're thrilled to publish the powerful voice of this young woman who, in her essay Turnaround., exhibits a spirit that refuses to be extinguished. A number of different people told me not to be so sensitive, despite how many times I was teased and bullied for the color of my skin. I developed a thick hard shell, making it hard for me to open up and be myself around anyone. I grew up a shy kid who never spoke up for herself or demanded much. I settled for what was around me and simply adjusted to flying under the radar. But not anymore . . .
Chelsea Dillaha is a 26 year old mother and student currently working towards her high school diploma. She dropped out of her freshman year and decided to come back to finish what she started. Her life has been anything but easy. Even with all these obstacles in front of her, she makes a way to get through the things that were meant to tear her down. You’ll understand her better once you read her poems, Past and My Face. Chelsea is a book you won’t want to put down. My face is reckless . . .
Boho accountant by day, aspiring storyteller by night with a colorful South Asian heritage, Sanam was on the trajectory of meeting all the checklist items scripted by her first generation, immigrant parents. Fortunately, fate or destiny had different plans and poured whiteout over all her checkmarks. Frustrated, she sat down to write her own checklist when she thought she heard God laughing. She is currently living a content, checklist-free life. Anyone who has ever had a problem with hair (or not) will love Sanam's Prayer for Hair. ​ hair and give it to me . . .
Dominic Lim is ecstatic to be making his debut as a writer on the Whoa Nelly Press website! After many years working as an actor, singer and classical musician, Dominic has finally decided to make a go at his other great love: writing. He is currently enrolled in the Post-Baccalaureate Certificate Program in Writing at UC Berkeley. Dominic is an intellectual property paralegal at Amyris, Inc. in Emeryville and is proud to call Oakland his home. We are delighted to feature Dominic's three-part autobiographical short story, ​Tinago Triptych. I just saw your movie tonight. I want you to know how much I loved it. You are the most handsome man in the world. One day I am going to marry you . . .
Andrea Torres is a communications professional in San Francisco. Her passions include cooking, her German Shepherd, the written word and her friends and family. It is with great pleasure that Whoa Nelly Press features Andrea's personal essay, Pisco Sour. At the age of six my world changed from family gatherings to leaving behind everything and everyone I held dear. The Shining Path, Ascendero Luminoso, a terrorist organization, were kidnapping families, blowing up power plants and instilling terror throughout the country. You never knew if you would come home to power or a house full of melted wax covered appliances because of the candles that littered every surface . . .
​ Tiana Altman is in her senior year at high school. In her applications to colleges around the country, she was asked to describe herself. She has a rich, complex background, explored in her personal essay, 3.17. 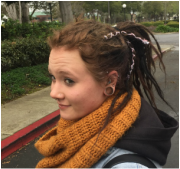 We are excited to feature the unique perspective of a young woman who will not let others' assumptions about her to stand in her way. When looked at deeper, one will learn that I came to the United States and had to learn English. One will learn that I got bullied and isolated and that I come from a broken household that caused me to run away during my freshman year. It will not tell you about the hours I spent in court meeting with my lawyer to resolve family matters . . . Co-founder of Whoa Nelly Press, Margo Perin is the poet of San Francisco’s permanent memorial Spiral of Gratitude. Her publications include The Opposite of Hollywood, Only the Dead Can Kill: Stories from Jail and How I Learned to Cook & Other Writings on Complex Mother-Daughter Relationships. A nominee for the Pushcart Prize, she has been featured in numerous national and international media, including O Magazine and NPR Talk of the Nation. The Body Geographic and Unholy Mother are from her sequel-in-progress to The Opposite of Hollywood. An excerpted version of Unholy Mother was published in the anthology How I Learned to Cook (Tarcher/Penguin). 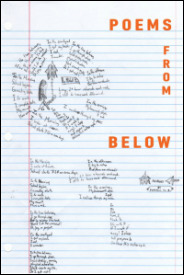 Poems from Below Poems from Belowis an anthology of poetry by eighth graders at Bowditch Middle School in Foster City, California. In two one-hour workshops in each classroom, poet-teacher Margo Perin gave a variety of writing prompts to the young poets who wrote based on what was important to them at that moment, on that day, at that time. The poems have not been edited, so that the untethered voices of the poets can be heard in the same manner in which they were written. The poetry residency was made possible by the support of gifted classroom teachers, Jasmine Amar and Rob Picciotto, who understand and promote the power of the imagination in the lives of youth. Funding was generously provided by Bowditch Middle School PTSA. I feel nothing except regret . . .
Why Does This Poem Have to End?Why Does This Poem Have to End? is a collection of poetry by fourth graders at John Muir Elementary School who, with the generous funding of California Poets in the Schools, wrote poetry under the tutelage of Whoa Nelly Press co-founder Margo Perin. Classroom teacher Ms. Liebert, one of the finest teachers in San Francisco with her quiet yet insistent belief in superior education for all children, welcomed Margo to lead her students into an exploration of their feelings and imaginations. Ms. Carter, her teacher in training, significantly contributed to the warm, supportive environment in which the children wrote and performed their poems. Why are there so many planets just over there doing nothing . . .